Being a square peg in a round hole is unhelpful in most roads of life, but not in art. In art, it is an advantage, an attraction. 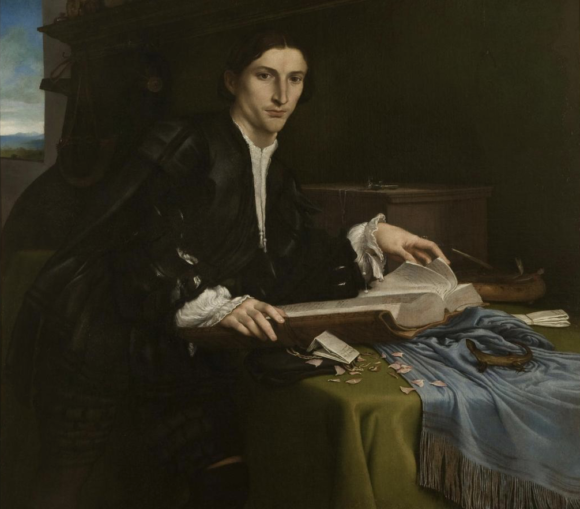 And in the case of Lorenzo Lotto — the un-Venetian Venetian, the Italian with German drives, a Renaissance artist with baroque impulses — not fitting in is the nearest thing there is to a defining characteristic. He was born in Venice in 1480. This is already unusual. Most big presences of the Venetian school — Giorgione, Titian, Veronese — were born on the mainland, but made their careers in La Serenissima. Lotto made his wandering up and down the Adriatic coast, from medium-sized town to medium-sized town, from Bergamo to Asolo, an unconnected Renaissance molecule blown by weak winds from Venice in the direction of the money. He wasn’t a lucky painter. His life was tough. But his clients were lucky, because Lotto always gave more than was expected of him. By the time of his death in Loreto, in 1556, he had lived a life full of true achievement, but spotted heavily with the scars of his wanderings. 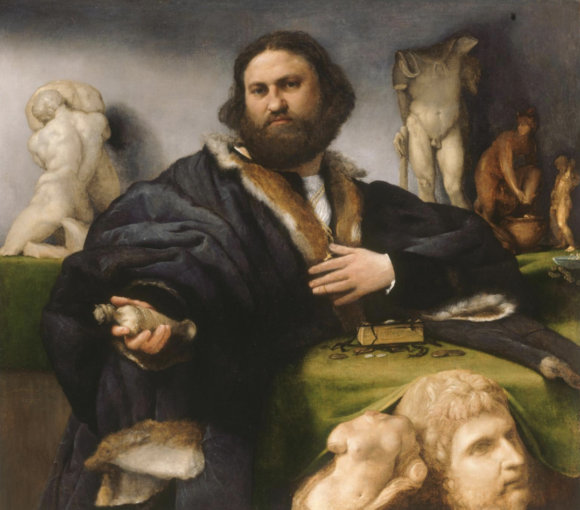 I know all this because I was fortunate enough to see Lorenzo Lotto: Portraits at the Prado, in Madrid, before it arrived in a reduced form at the National Gallery. The bigger Madrid show did its own characterful wandering from room to room, style to style. This time round, we get less bumbling, though it’s still a journey full of surprises. 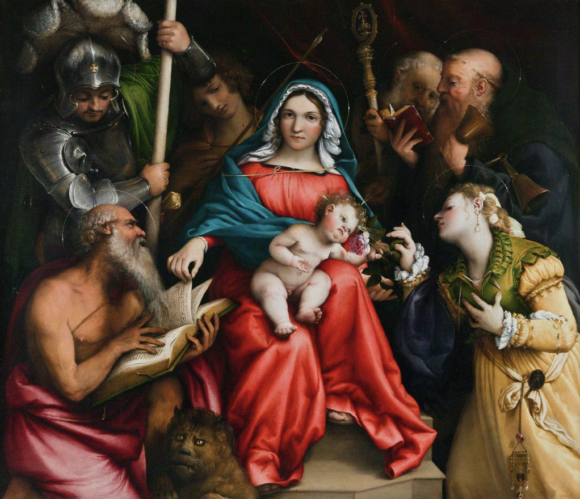 Perhaps the only reason Lotto’s crazy altarpiece of the Virgin in Glory from the cathedral in Asolo did not kick-start my giggles on this occasion is that I have seen it before. They were not giggles of humour or mockery, let me quickly add, but giggles of uncontrollable pleasure, an unstoppable release of delirium that happens rarely in art. What makes this such an extraordinary painting is the picturing of the Virgin Mary as a middle-aged woman. Hah! Mary is one of the most ubiquitous presences in art. She’s in every Nativity, every Assumption, every Madonna and Child. And in all these countless portrayals, she is always young and beautiful. Nowhere have I previously seen her presented as a stern, middle-aged governess. But that’s what Lotto gives us. What he’s done in this gloriously strange altarpiece is to include a portrait of Caterina Cornaro, the ruler of Asolo, as the ascending Mary. She was in her fifties when he painted her: an ill-fitting Madonna. But there she is, floating 6ft above the ground, with two saints, the old Anthony the Abbot and the young Louis of Toulouse, sighing fondly at her awkward departure to heaven. And the whole scene, the sighing saints, the heavy Caterina — too fat to fly! — is set in a gorgeous Veneto landscape of distant hills and diddy houses. Because Lotto, among his many talents, was a delightful landscape painter. From the off, he was different. The first room has just the Asolo altarpiece in it, and three pint-sized portrayals of men, each of whom might have been painted by a different hand. The best of the men, Bernardo de’ Rossi, bishop of Treviso, is so realistic, you can see his warts: a serious face, looking down at us with a touch of judgment. He was painted in 1505 under the evident influence of Dürer, who was in Venice at the time. Yet the young man opposite, from 1512, big-eyed and pale, is no longer realistic. Staring out with heraldic stiffness, his paleness and prettiness belong in a world of caricatured ideals. A long way from cartoonish, of course, but with something Bambi-like in his ungainly youthfulness. Thus it always is with Lotto. One moment he’s utterly convincing, the next a mite bonkers. His waywardness, so un-Renaissance-like, allows him to try out such wacky pictorial solutions. In the portrait of Lucina Brembati, c 1520, we see a plump Italian worthy, dressed in dark velvet and hung like a Christmas tree with baubles of pearls and gold. Her hands are lifted to her bosom so we can better see her rings. And on her podgy face, Lotto has captured a fabulous expression of impish vanity. It’s brilliant. And topping it all is a hilarious symbolic touch. In the dark sky behind Lucina is a glowing moon with the letters “CI” written on it. Get it? The Italian for moon is luna. Put “ci” in luna and you get Lucina. This is art chasing the pleasures of a Times crossword. While he was doing all this — being so different — Lotto was looking for somewhere to settle. He never worked for the big courts. Never married. Never owned a house. Indeed, a couple of the pictures here feature his landlords and were given to them in lieu of rent. Although he returned intermittently to Venice, he never feels like a proper Venetian artist in that dreamy poetic manner invented by Giorgione. Instead, for the length of the show there is a sense of flux. Three qualities manage to stand out. First, he was particularly good at capturing elusive expressions. In the double portrait of Marsilio and Faustina Cassotti, a pair of upper-classers from Bergamo, the husband and wife are hugged by a hovering Cupid as they exchange wedding vows. But will you look at the expression on Marsilio’s face? He’s trying not to grin. He knows that we know that he needs to behave like a Renaissance worthy. But he can’t quite hack it. The second characteristic is Lotto’s symbolic inventiveness. Remember Lucina? At the centre of the show is a suite of his biggest and best portraits. All of them offer an appealing mix of superb description and sneaky double meanings. This is the height of his career, from 1520 to 1535. He’s back in Venice and the city’s nobles are hiring him. Andrea Odoni, a famous collector, is proudly showing us his classical sculptures. But hang on a minute. Isn’t the small figure at the back of the shelf having a pee in a bowl? Yes, he is. Perhaps that’s why Odoni, too, is at the point of grinning. Lotto’s most surprising quality is his talent for painting old men. The show’s last room is filled with the battered and wistful faces of a generation that has survived everything the fates have thrown at it, but is now on its last legs. Among them we must count Lotto himself, who does not appear in person, but whose spirit is surely stamped on this sad parade. Lots of male artists have been good at painting beautiful young women. Few have been good at painting broken old men. 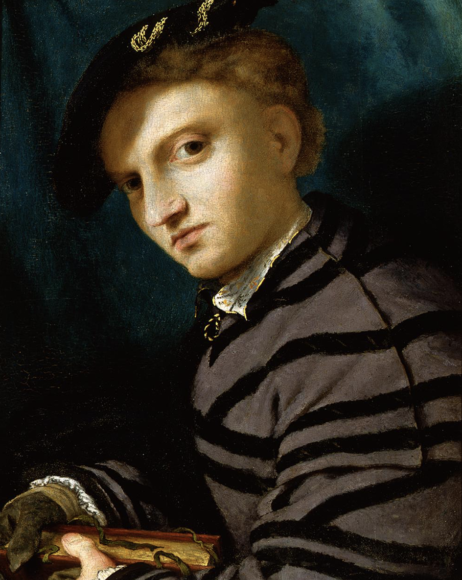 Lotto at the end of his career — living in a Dominican house in Loreto, alone, uncommissioned, artistically forgotten — becomes the Rembrandt of the Renaissance. Speaking of artists who were good at painting men, I am overjoyed to see that Tate Britain has mounted a special display devoted to the exceptional English painter William Dobson (1611-46). In his cruelly brief career, Dobson managed to become the greatest native contributor to the baroque age. More than that, he was something of a proto-Hogarth: blunt, four-square, unmistakably British. That his career unfolded at the height of the English Civil War (1642-46) gives his art enormous historical clout. He was there. He saw it. And, as a record, he left behind a set of marvellously ambitious portraits, painted, finally, on a large and manly scale. The Tate owns a couple of these, notably the fine Endymion Porter, favourite of Charles I, who dresses like a nobleman but looks like a village butcher. Anyone for pork sausages? It’s a small show. Half a dozen flashes of preternaturally confident British portraiture. Now all we want is the big show.